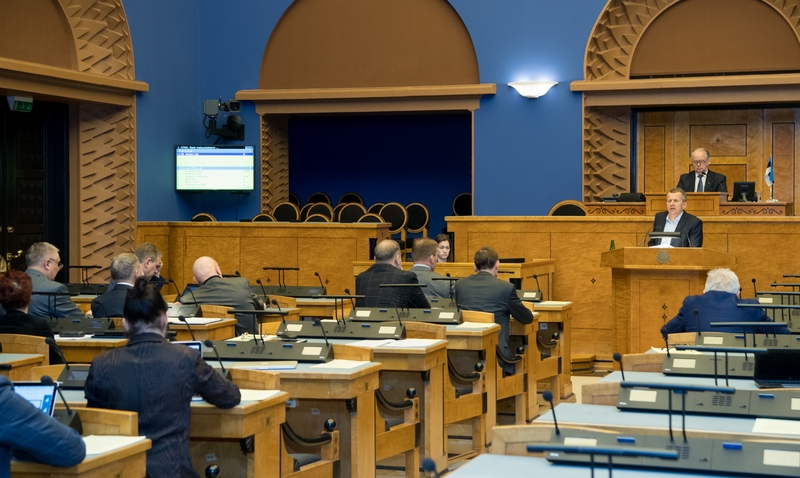 At today’s sitting, the Riigikogu discussed the future of the Estonian tax system as a matter of significant national importance initiated by the Estonian Reform Party Faction. Jürgen Ligi, Chairman of the Estonian Reform Party Faction, Jaan Puusaag, member of the Council of the Estonian Employers’ Confederation and member of the Taxation Working Group, and Ranno Tingas, Ernst & Young partner in Estonia, made reports. In his speech, Jürgen Ligi criticised the election programmes of political parties in regards to taxes. “This time, too, the election promises do not deal very much with solving of the problems. Their aim is to reap gain for the political party,” Ligi said. He thinks that in this situation, the parties should look at each other and in the mirror, and remember that the idea behind the tax system is to collect the amount of funds necessary for the functioning of the state. This has to be done in a manner that disturbs the economy as little as possible, so as not to increase inequality. Ligi said that individual and private choices should not be made a concern for the taxpayer. In his opinion, there should be no fringe benefits, and salary should serve their purpose. “Derogations reduce the tax base and this puts a pressure on the state to raise taxes,” Ligi explained. He noted that low tax rates and a wide tax base were among the basic values of the tax system. In his report, Ligi also spoke of the political parties’ views on the value added tax, labour taxes, consumption taxes, income tax, alcohol excise duty and the basic exemption. Jaan Puusaag brought proposals from employers before the Riigikogu. They are the following: simplicity, increasing the number of large taxpayers, correction of errors and ensuring of competitiveness (excise duties, income tax minimum), tax exemption for health expenses and a social tax cap. Puusaag said that the most important expectation of the employers was that the tax burden would not increase any more. Employers hold the position that the basic exemption from income tax should be harmonised for everyone, and the simple and understandable system should be restored. Puusaag said that seven per cent of employers paid 93 per cent of the total tax revenue. This accounts for around 7000 companies while there are a little more than 100,000 companies in Estonia. “All sorts of fine tuning and increasing and decreasing of excise duties have less impact than increasing of this seven per cent to eight, for example, would have. This should be the purpose and the aim of the state,” Puusaag said. Tingas also touched upon stability and predictability and simplicity as important keywords of the tax system. “Tax system does not have to be primitive, but any kind of complexity in the tax system should be seriously weighed and justified, and it should serve a greater purpose,” Tingas said. During the debate, Kersti Sarapuu (Centre Party), Andres Herkel (Estonian Free Party), Maris Lauri (Reform Party), Sven Sester (Isamaa), Jüri Adams (Estonian Free Party), Aivar Sõerd (Reform Party) and Peeter Ernits took the floor. The Act on Amendments to the Fertilisers Act and the State Fees Act (639 SE), initiated by the Government, simplifies the registration of fertilizers. For example, the placing on the Estonian market of new fertilizers that are sold in small quantities will become more favourable. One aim of the Act is to ensure efficient supervision of fertilizers marked “EC fertilizer” in the domestic market. In the future, all handlers of fertilizers operating in Estonia, including distributors of products marked “EC fertilizer”, will have to submit a notice of economic activities on the basis of which the handler and the fertilizer sold by the handler will be entered into the register. This will allow to obtain actual and up-to-date data on the Estonian fertilizer market from the fertilizer register. The Act updates the state fee system for fertilisers handled, as a result of which the administrative burden involved in the calculation and payment of the state fee for handlers of fertilizers as well as the time and resources involved in the checking of data by the supervisory authority will decrease. According to the amendments, a handler of a fertiliser pays the state fee for the conformity supervision operations regarding the fertiliser in the year when the handler commences the handling of the fertiliser and in every subsequent year when the handler handles the same fertiliser. Besides, the fees for entering a fertilizer in the register of fertilizers, for the amendment of a register entry and for certified extracts are eliminated. In the future, state fee will have to be paid once a year, instead of the current two times. Thus the calculation of state fees will become significantly simpler. 67 members of the Riigikogu voted in favour of the Act. Under the Draft Resolution of the Riigikogu “Release of the Justice of the Supreme Court Jaak Luik from the Office of Justice” (801 OE), submitted by the Chief Justice of the Supreme Court, justice of the Supreme Court Jaak Luik is released from the office of justice. The cover letter notes that on 25 January 2019 justice of the Supreme Court Jaak Luik had submitted a request to the Chief Justice of the Supreme Court, requesting him to make a proposal to the Riigikogu to release him from office as of 1 December 2019 at his request in connection with his retirement. During the debate, Jaanus Karilaid (Centre Party) took the floor. 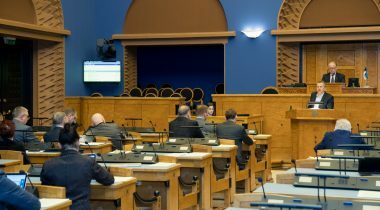 64 members of the Riigikogu voted in favour of the passage of the Resolution and there were two abstentions. Due to the end of the working hours, the deliberations of three drafts were postponed to tomorrow’s sitting. They are the following: the Bill on Amendments to the Citizen of the European Union Act and Other Acts (Withdrawal of the United Kingdom from the European Union) (781 SE), initiated by the Government, the Bill on Amendments to the Code of Civil Procedure and Amendments to Other Associated Acts (establishment of the procedure for declaration of enforceability of decisions of arbitral tribunals made in Estonia) (749 SE), initiated by the Government, and the Draft Resolution of the Riigikogu “Making a proposal to the Government of the Republic to Impose Sanctions in connection with the Attack and Seizure of Ukrainian Vessels in the Kerch Strait” (782 OE), submitted by the Free Party Faction.